A technician at motor dealership Pebley Beach has been named Swindon College’s Motor Vehicle Apprentice of the Year. Ryan Shorter (21) will be crowned at a ceremony in June after completing his final assessments six months early – but just 12 months ago he doubted he would ever finish his apprenticeship. 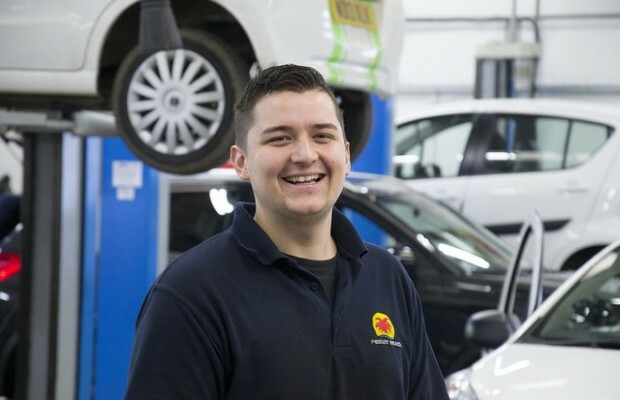 After starting his apprenticeship, Ryan gained placements with a number of independent garages, and although he enjoyed the work he was not able to gain the relevant experience to pass his modules. In August, Ryan joined Pebley Beach, the 2014 Wiltshire Apprentice Employer of the Year. Under the watchful eye of master technicians Martyn Owen and Mark Illsley, Ryan sped through all his assessments – finishing six months early. Dom, who is a Swindon Borough Council apprenticeship ambassador, said: “Apprenticeships are an excellent way of home-growing your own talent.